Posted On December 18, 2015 by Team iCynosure. Memory slips are the worst things that can happen to anyone. I personally know how frustrating it is when I misplace my keys or the phone charger, or when I can’t remember where I’ve saved a document and with what name. More than the loss I regret the time I waste looking for it or trying to remember where I last kept it. It takes many precious moments from the day to rerun the schedule, retrace the steps and figure out where I would have kept it. I promise to be more vigilant, more careful and never be so absent-minded so as to misplace something, but it sometimes doesn't work. And trust me I am not the only one who is so forgetful; there are many who are equally absent-minded and hit by amnesia from time to time. Case in point my baby sister. My little sister literally drives us all insane with her recurring episodes of forgetfulness that are absolutely maddening. This morning she frantically woke me up at an insane hour of 5.30am and started blabbering, “I woke up for my run but now I cannot find my iPod.” Ouch, I thought you're waking me up for your stupid iPod, go run without music today. She coaxed, threatened and finally pleaded with me to help her look for it and so we looked and looked and looked. We rummaged every drawer, flipped every cushion in the house and checked all charging plug points. But the little devil was nowhere to be seen; I wanted to scream, 'Go without it what’s the big deal'? But she went on and on literally turning the house upside down and still nothing. Now it was almost 6.15am and all I wanted to do was to crawl back into bed when her monologue began. "Yesterday I came back from my run with my iPod and went for a shower. I got dressed and then had breakfast, soon after which I went to college. Once I came back I went up straight to my room and did some project work while listening to music. Just before dinner, I cleared my table and then after dinner, we went to sleep for a few hours. Where could it be?" As soon as I heard this, I went into her room picked her college bag and handed over her iPod from it. With a huge frown on my face, I went to my room and slept. Over the years I’ve started to accept my shortcoming and devised a plan to keep at least my precious things safe and sound. Sometimes my tried and tested methods work and sometimes they don’t. And to counter those few instances when the method doesn’t work I’ve started to think about bringing the concept of an everyday locker system into use. 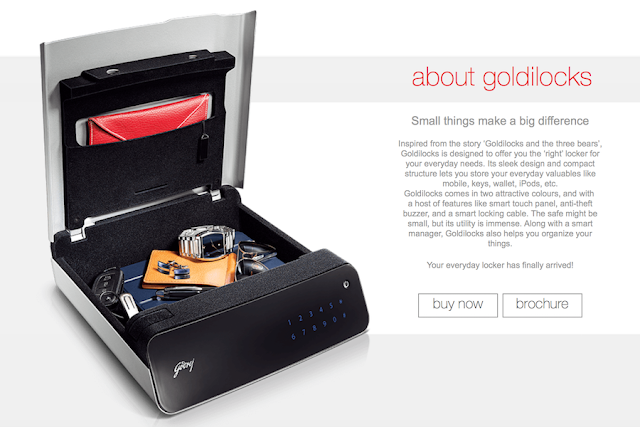 Godrej’s Goldilocks is India’s first-of-its-kind personal locker for everyday use to store your daily valuables like keys, credit cards, watch, wallet, and everything you think you tend to misplace. I think my forgetful sister and everyone like us would benefit from a locker like this to ensure we never misplace or lose any important and precious things and moreover don't trouble anyone else to find them. 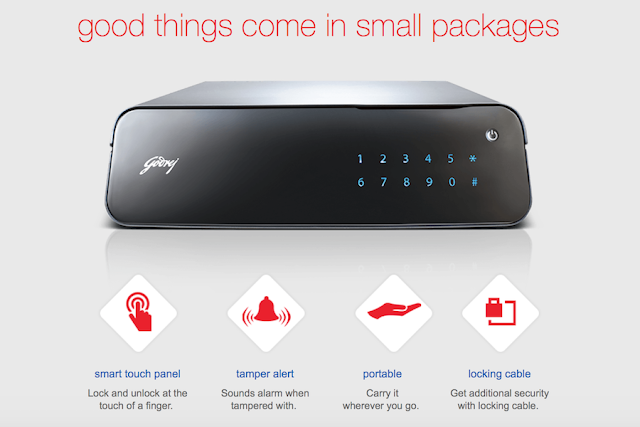 The advantage of the locker is that it’s compact and portable and a key to one's forgetfulness.